Interests in metamaterials with broken time-reversal symmetry have grown significantly in recent years due to their potential technological applications in differential bidirectional wave control. 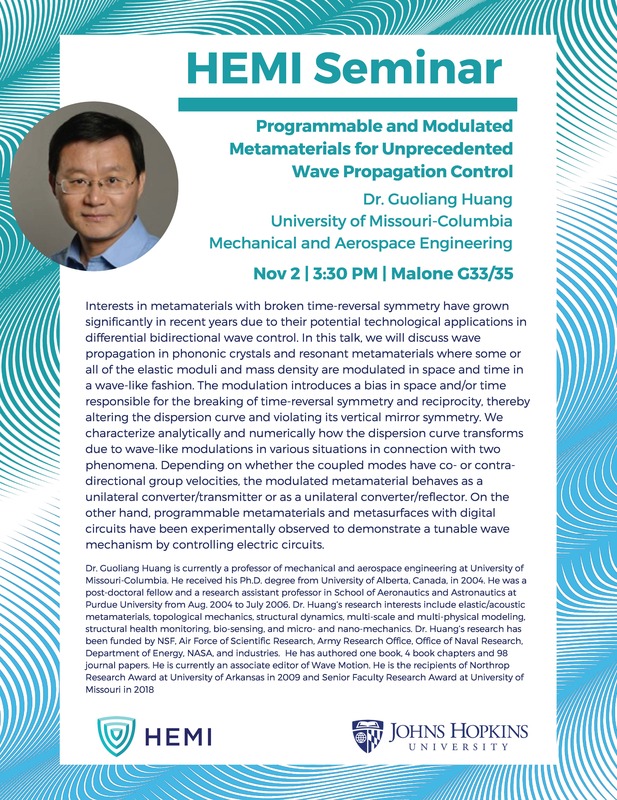 In this talk, we will discuss wave propagation in phononic crystals and resonant metamaterials where some or all of the elastic moduli and mass density are modulated in space and time in a wave-like fashion. The modulation introduces a bias in space and/or time responsible for the breaking of time-reversal symmetry and reciprocity, thereby altering the dispersion curve and violating its vertical mirror symmetry. We characterize analytically and numerically how the dispersion curve transforms due to wave-like modulations in various situations in connection with two phenomena. Depending on whether the coupled modes have co- or contra-directional group velocities, the modulated metamaterial behaves as a unilateral converter/transmitter or as a unilateral converter/reflector. On the other hand, programmable metamaterials and metasurfaces with digital circuits have been experimentally observed to demonstrate a tunable wave mechanism by controlling electric circuits. Dr. Guoliang Huang is currently a professor of mechanical and aerospace engineering at University of Missouri-Columbia. He received his Ph.D. degree from University of Alberta, Canada, in 2004. He was a post-doctoral fellow and a research assistant professor in School of Aeronautics and Astronautics at Purdue University from Aug. 2004 to July 2006. Dr. Huang’s research interests include elastic/acoustic metamaterials, topological mechanics, structural dynamics, multi-scale and multi-physical modeling, structural health monitoring, bio-sensing, and micro- and nano-mechanics. Dr. Huang’s research has been funded by NSF, Air Force of Scientific Research, Army Research Office, Office of Naval Research, Department of Energy, NASA, and industries. He has authored one book, 4 book chapters and 98 journal papers. He is currently an associate editor of Wave Motion. He is the recipients of Northrop Research Award at University of Arkansas in 2009 and Senior Faculty Research Award at University of Missouri in 2018.